The cure for any doctor or medical care specialist is in this physician window. Burgundy, Gold and Royal Purple stained art glass, this window will delight your medical professional. The cure for any doctor or medical care specialist is in this physician window. 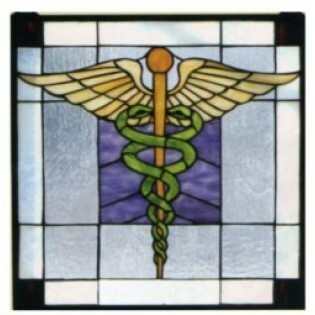 Burgundy, Gold and Royal Purple stained art glass, this window will delight your medical professional. The Physician Stained Glass Window is framed in solid brass and is created with 117 pieces of hand cut glass it is perfect for medical professionals as well as hospitals or other medical organizations.